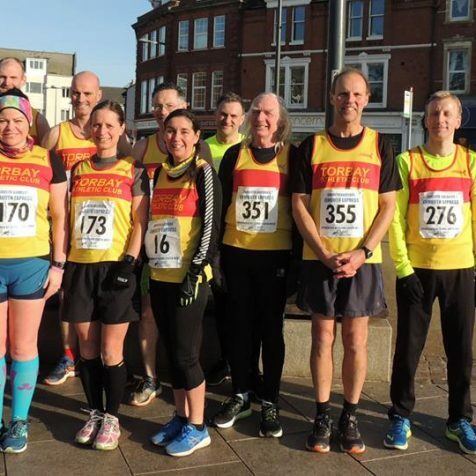 Fifteen club members journeyed to take on the Exmouth Express 5 mile road race. The two lap course snaked around the town centre and along the seafront. Although these runners were well prepared for the freezing temperatures and the biting Exmouth breeze, before long running in the warm low sunshine had them peeling off the excess layers of hats and gloves. Team Torbay ran really well with several runners clocking personal best times. Five Torbay A.C. 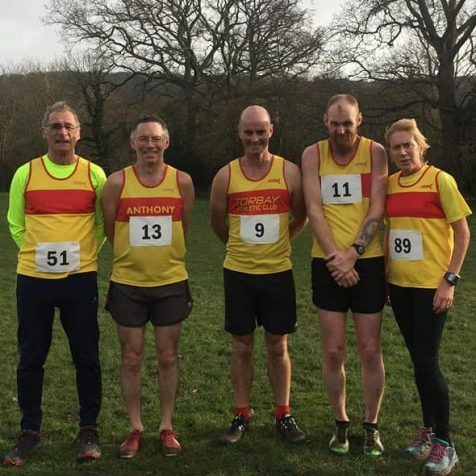 Athletes competed in the South West Vets Cross Country Championships at Sidford, which attracts some of the best over 35 year old runners in the region. The course is a relatively flat 6 km course organised by Torbay A.C’s Bill Valentine, the Torbay team did their club proud with Martyn Breslan and Anthony Raine collecting prizes by finishing 3rd in their Age Categories also Irene Hewings finishing 4th and Steve Weeks 5th in their age categories. Sadly Andy Park had to retire from the race, but provided much needed support and encouragement from the sidelines. Ladies & Men’s Vets (6000 metres) – 8 Martyn Breslan (24.26) – 13 Steve Weeks (24.47) – 18 Anthony Raine (26.04) – 51 Irene Hewings (33.43).